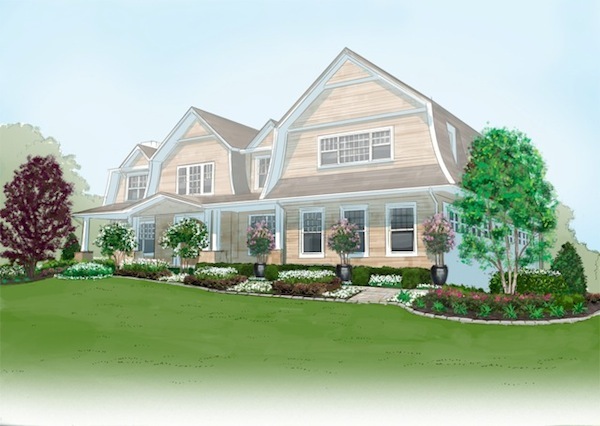 Over the next several days, we will be finishing up our look at the Hampton Designer Showhouse. For the weekend, we’ll be spending a little time outside. 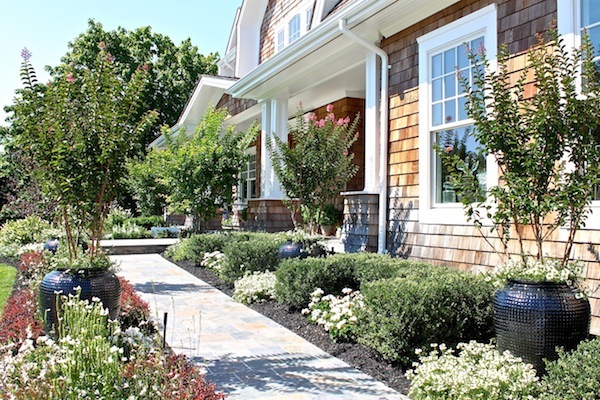 As I approached the house, I was immediately struck by the handsome landscaping. 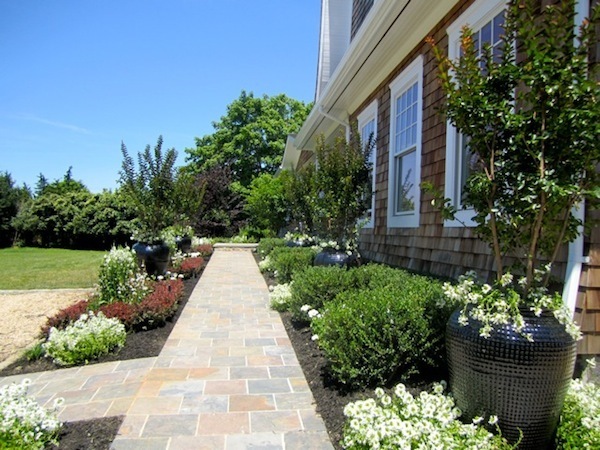 Casual, yet tailored, it was a lovely combination of container and in-ground plantings. While I took a few of my own shots above, I was delighted to receive some additional images from the designer Antonio Parratta showing the progression of the landscaping, starting with the original sketch below. Parratta used mature specimen trees and shrubs to stay in line with the scale of the large house. Here you can see how he installed a combination of square and round hedgerows to establish the basic architecture of the design. A large portion of the plantings are white. Parratta explained, “This color blocking adds a huge impact and maintains a flow keeping the design simple and elegant. Flower varieties were chosen for their informal and loosely structured appeal. As someone with a brown thumb, I am always so impressed with successful landscape design. Through careful use of color, texture and scale, Parratta transformed this empty property into an inviting, charming entry. 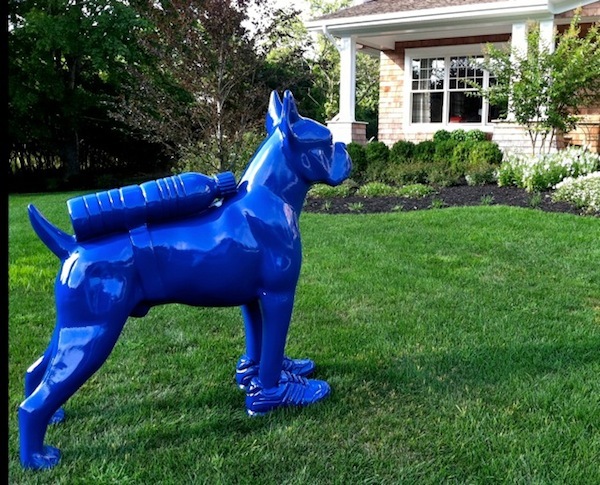 Since visiting the showhouse, there has been a new addition – a mascot named the Cloned Bulldog. Artist William Sweetlove, represented by Shelter Island based art dealer Karen Boltax, uses his brightly colored animal sculptures, scattered around the Hamptons this summer, as a commentary on climate change and how “all beings adapt to their surrounding, which is why the oversize animal sculptures wear backpacks and carry water bottles.” Parratta reports that he has become a popular feature and photo opp for those visiting the showhouse! This entry posted in design, garden, interior design. Entry Tags: 2012 Hampton Designer Showhouse, Gardens, Landscape design, Parratta Design Management, Sculpture, Traditional Home magazine Bookmark the permalink. Love the mix of container garden and planted beds and what fun to have a blue bulldog protecting the property! 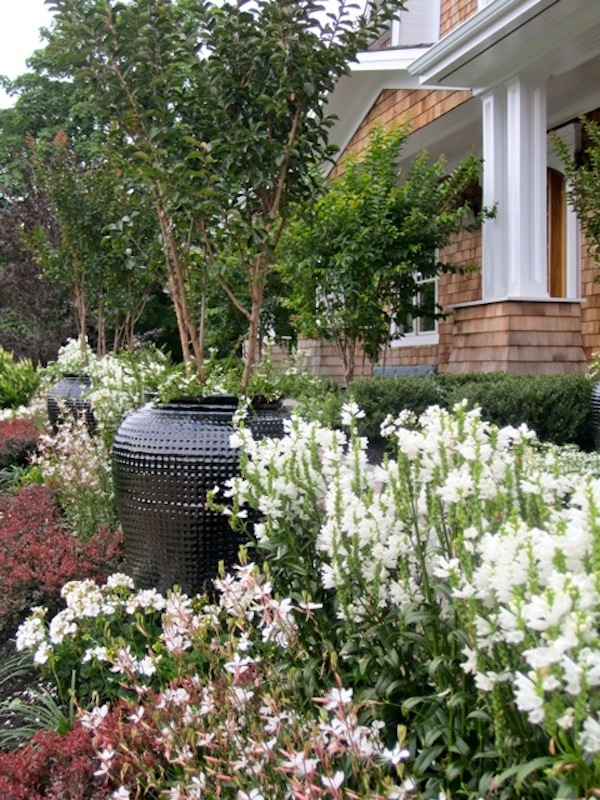 My friend and I approached the house and we immediately said the use of white flowers and plantings was beautiful. The landscaping was indeed inviting. You have really ivered every square inch of the home!! Lovely, inviting plantings, hoping to see the inside next! Really curious about what kind of trees are in the planters and can they live in them permanently? Great point to highlight- it really does elevate the eye. The trees in the pots are crape myrtle , lagerstroemia variety ‘sioux’, This pink variety was chosen to contrast the white flowers and soften the design . The branching system is clumped opposed to a single stem. 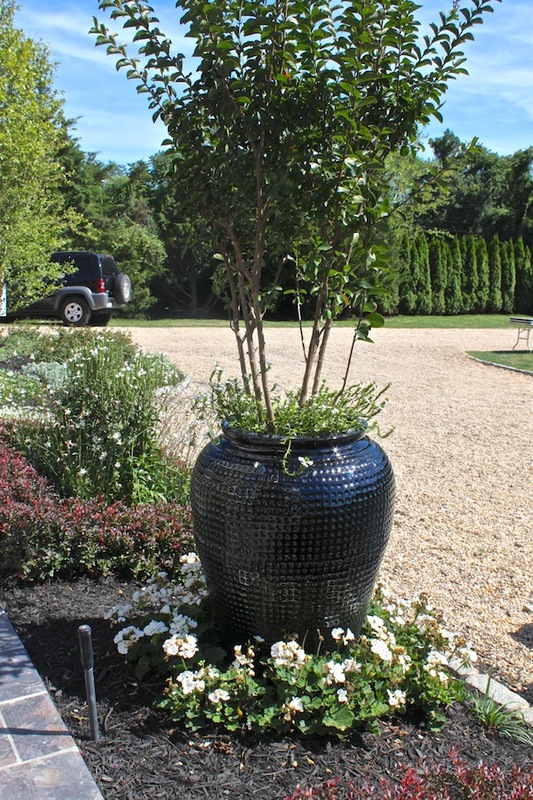 They are hardy in the Hamptons when panted in the ground,but should winter over in a protected area or be insulated when in planters to avoid freezing. They will live in the pots permanently,but like any tree planted in a container ,their longevity is compromised. The front garden is so lush and wonderful. It truly looks as though it is a mature garden yet just a few weeks ago I swear it was a dirt lot…. Mr. Parrotta did a fantastic job with this and I look forward to having him on my projects ASAP. 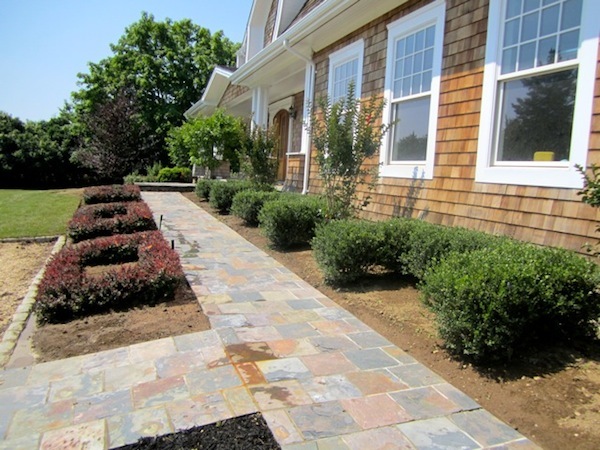 Great landscaping design and especially liked the design of the pavers which is used in the driveway of your garden. 80 queries in 0.518 seconds.